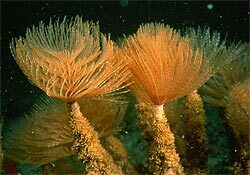 The European Fan Worm is a filter-feeding tube worm with a leathery tube and spiral feeding fan that can reach 10 to 15cm in diameter. The tube can protrude up to 40cm above the sediment and bury as deep as 10cm into the sediment. Sabella commonly forms clumps of two or more individuals, creating a canopy of feeding fans that stretches over the sediment. This tube-dwelling worm remains inside its tube and extends a fan-like crown of tentacles through the opening of its tube. When the worm is disturbed it withdraws into the tube and closes the end off. The tube is often covered with encrusting or fouling organisms . It is generally found in shallow subtidal areas in depths from 1 to 30m. In shallow waters, worms are solitary and are commonly found growing on a wide range of solid surfaces, including artificial materials (rocks, concrete, wood, steel), and benthic organisms (ascidians, mussels, oysters. It is capable of rapid growth rates - the length of the tube may grow 10cm annually. It is native to the Mediterranean and the eastern Atlantic Coast. It is common to countries such as Spain, France, Italy, Turkey and Morocco. It was first discovered in Western Australia in 1965, and has since been recorded in Victoria, South Australia Tasmania and NSW. The most likely mechanism for its introduction would have been juveniles or adults attaching themselves to the hulls of boats. It was probably first introduced to Albany in WA and from this point spread to other states through coastal shipping, either as adults attached to hulls or as larvae in ballast water. , these marine pests can impact on our coastal waters by reducing fish numbers, fouling boats and reducing their efficiency on the water, destroying aquaculture and cost millions of dollars to control. In WA, there is no evidence to suggest that the European fan worm is having a direct effect on any fisheries or native species. While they have been observed to grow on mussel ropes, farmers do not consider them a significant nuisance. 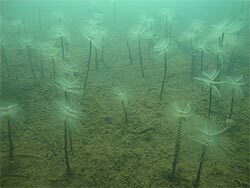 However, the fan worm has been recorded as having a serious environmental impact in other areas where it has invaded, including Port Phillip Bay in Victoria. They have been found to overgrow seagrass; compete for food with native oysters, mussels and scallops; excrete nitrogen which contributes to algal blooms; and clog dredges and nets. As a filter-feeder, it has been found to have a higher filtering capacity than most seagrass beds. This ability results in a reduction in the amount of phytoplankton in the water column, which in turn has the potential to impact on the whole ecology of the area.